Classic Ironworks have a large variety of different styles of railings for your perusal. 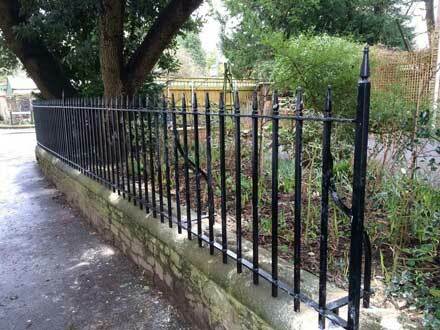 As wrought iron rail specialists, we manufacture, supply, and install the highest quality of wrought iron rails and gates in the South West. Our wrought iron railings designs come in different heights. We can install your new wrought iron railings UK at ground level or alternatively on top of walls. Our range of wrought iron designs are made to measure, and will add allure and value to your property. As leading manufacturers and suppliers, we strongly recommend you consult our team of experts. We will offer impartial advice for all your stylish rails, classic rails, gothic rails, Edwardian rails, and Victorian balcony needs. Our range of rails and stakes stretches from decorative wrought iron to contemporary railings and rails for Juliet balcony. We can manufacture rails to fit all situations and budgets. Our wrought iron prices are hard to beat in the local area as well as nationally. Wrought iron rails from Classic Ironworks will look superb when installed at your period or traditional home.One fine example are our London and Victorian rails that are immensely popular amongst our client base. We can install plain or metal designs on balconies, roof terraces, deckings, handrails, and garden walls. Our manufacturers will discuss your exact needs with you at a no-fee consultation. All our rails are finished in order to ensure low maintenance and a finish that is rust-proof and durable. Contemporary rails for modern homes are also available from Classic Ironworks. Your choice of materials extends from decorative metal rails to tough and durable steel. Made to measure, we can also match your railings to other features of your home such as your existing wrought iron and metal work. Whether you are in search of wrought iron stair rails, wrought iron balcony railings, or even timber rails for your property, we are confident that Classic Ironworks will deliver a standard of excellence. Our manufacture, supply, and installation will leave you with 100% customer satisfaction.